Photo by Pieter Henket, Congo Tales. In November, 2018 the book Congo Tales: Told by the People of Mbomo was published in the U.S. on Prestel / Random House, and, this month, the second edition is coming out. 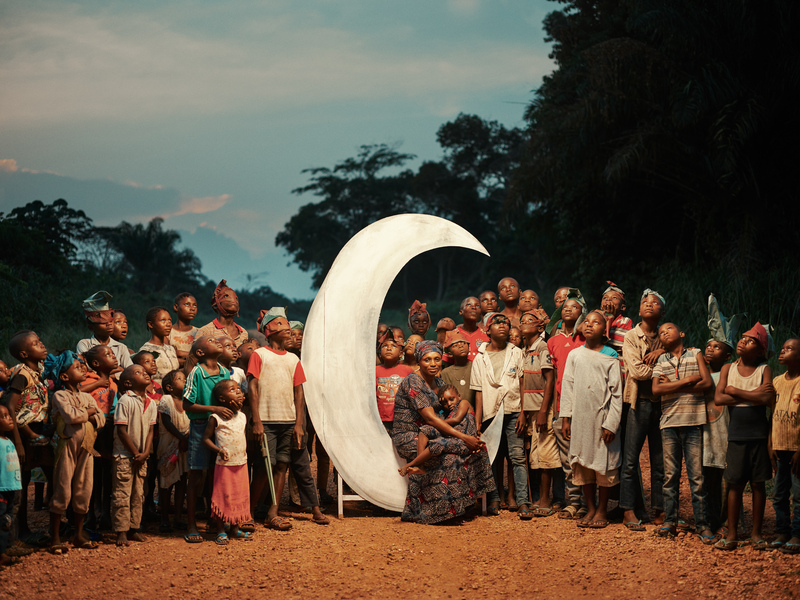 In Congo Tales, national Congolese who live in the Mbomo district of the Congo Basin, staged their never-before recorded mythology in the Odzala Kokoua National Park for fine art portrait photographer Pieter Henket. Under the canopy of ancient rainforest from which they sprang, they communicate the magic and mystery of this little understood place, and its incalculable value to the planet. The publication of Congo Tales happened exactly 5 years after my partner Stefanie Plattner and I embarked on a mission to create more awareness for the Congo Basin, specifically, to bring the universal wisdom of the National Congolese and awareness of the critical importance of the Congo rainforest (which is second only in size to the Amazon) to the global community. The Congo Tales book is part of the way that we have decided to try and reach this goal. And the initiative we’ve created along the way — Tales of Us, which offers a new approach to communicating the urgency of protecting the world’s most powerful and fragile ecosystems and the people who call them home — is how we plan to continue. Stefanie and I, along with photographer Pieter Henket, author Wilfried N’Sondé, philosopher Kovo N’Sondé, and hundreds of people from the Mbomo district of the Republic of Congo worked for 5 years to bring Congo Tales to life. Working on Congo Tales got me out of my ego as a producer, filmmaker and editor and into true purpose. What I gained from the project and the journey was transformative for me as a person and an artist, and, I think, these lessons are universal. Being connected can be a great thing. And for a producer it’s a dream to have a smartphone always ready in your pocket. But it can also become an obstacle to learning about something on a deeper and more engaged level. I visited the Congo 10 times over three years working on Congo Tales. Naturally, as a millennial, when any kind of question popped up, I would navigate promptly to the mobile phone in my pocket, like a cowboy to his gun in a western movie shootout scene. However, due to its isolated location, your phone mostly becomes a handy standby camera. And even if there was access to the internet, weather forecasting would have to make giant leaps in accuracy to predict the sudden and dramatic weather changes in the Congolese rainforest. At a certain point I realized it was better to leave it in my suitcase altogether. I felt slightly amputated without my phone at first, but this experience stripped me down, forced me to confront myself, and, instead of looking up something when I needed it, I had to come up with something instead. Having been disconnected in the Congo for longer periods of time has inspired me to slow down my pace and take deep dives in order to gain authenticity with the responsibility I take as a content creator. At the beginning of my research trips to the Congo I felt a certain restlessness to document all of the things I was seeing around me. Due to the unspoiled beauty of the Congo Basin it was hard not to fancy myself a photographer. However, I didn’t carefully curate what I was documenting, but was rather making sure that I had it to share it. But creating the Congo Tales series required a lot of focus. Seeing the results of Pieter’s photo-series of course has shown me that portraying our subjects had to be done with a very uniquely talented eye, not to mention a large team. Parts of the stories we had found and recorded were distilled to a single image and it was a collective effort to enact and construct them. It was pretty tough for the foreign photo team as the burning sun would quickly exhaust them; locations were often picked that were also attractive for hyenas; and the weather as I mentioned before was always absolutely unpredictable. Even though digital photography has given us unlimited space to document what we want to remember, watching a team working to carefully construct one single image to produce one powerful photo has made me think more about where – and how – I aim my iPhone. Working with the Congolese also helped me reflect on how we have our pictures taken. We all know our closest friend’s picture face, and often we also know what our “better” angels are. However, the locals who acted out the mythologies for Pieter and his team didn’t go through these inward struggles before they were photographed — rather, they were thinking about the stories they were telling. That’s because they had close to zero experience being in front of a camera. Not worrying about how they looked or what photos they would post on their social media made it a much purer journey for them when it came to taking on the roles of the myths they were depicting, and working with Pieter to produce sincere moments of storytelling. The Congolese myth The Little Fish and the Crocodile tells the story of a crocodile who befriends a fish. One day, the crocodile, following his instincts, eats his friend’s eggs. The story communicates a universal truth that nature abides by laws all its own, a timely message for a world in environmental crisis. When Stefanie was directing the short film based on the story we seriously considered changing the narrative so it had a “happy” ending. But when the local children acted the story out for us in a local theater we saw that they were not in fact troubled by the ending at all. We were. Because they hadn’t been conditioned with “happy” endings (not to mention that they understood that animals eat each other, and they know where meat comes from) they were totally open to the Congolese myth, and the powerful lesson about nature’s laws it communicates. Finally, I learned that, when it comes to storytelling, if the story is not about you or from your experience, the only authenticity you can gain is from listening. That is a universal wisdom that enhances all creativity. Eva Vonk is the editor, along with Stefanie Plattner, of Congo Tales, which was published on Prestel / Random House in November, 2018. She is also the project initiator for Tales of Us, which is an ongoing multimedia series that offers a new approach to communicating the urgency of protecting the world’s most powerful and fragile ecosystems and the people who call them home.